Transactions can only be credited if they have already settled. You may perform a full or partial refund, but cannot perform a refund for a higher amount than the original transaction. If a transaction has not yet settled and you'd like to cancel payment, you should perform a Void. See section below for information on Voids in 1stPayMobile. Log into the 1stPayMobile App using your Login PIN. You will be brought to the Sale Screen. In the upper left corner, tap Sale. This will display a popup box giving the option to change Transaction Type. Select Refund. Enter the amount to be refunded. You may also adjust Tax and enter a Memo if desired. You are brought to the Card Entry Screen. If using a card swiper, swipe the credit card. If not, enter the card information manually. Key in the Zip Code and CVV2. Enter any other card information that is either desired or required by the administrator. Tap 'Next'. If a field is required, you must enter the information and then close the keypad for the information to be submitted. Be sure to tap 'Done' in the keypad. You will be brought to the Signature Screen. Have the customer sign. Tap 'Submit'. You will be brought to the Transaction Detail Screen. If the refund was successful, APPROVED will appear in green letters. To credit or refund a transaction, you may do so through the Transaction Center. See instructions here. Transactions can only be credited if they have already settled. If a transaction has not yet settled and you'd like to cancel payment, you should perform a Void. See section below for information on Voids in 1stPayMobile. A void is performed on an authorized but not settled transaction and cancels the authorization issued on the card. Once you void a transaction, you will not be able to perform any further functions on the transaction. Enter your mobile PIN to log into the 1stPayMobile App. If your account is Multi-MID, select the MID you'd like to access. 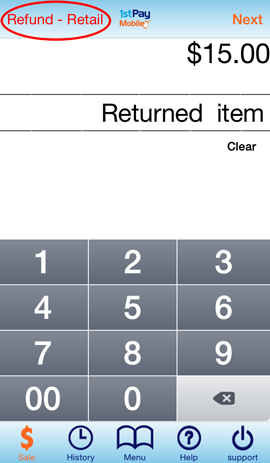 In the bottom Menu, tap the Clock Icon to access the Transaction History screen. Recent transactions will be displayed. Tap the transaction you'd like to void. You will be brought to the Transaction Detail screen. Scroll down to the bottom of the page, and you will see large blue text that says 'Void'. Tap Void. 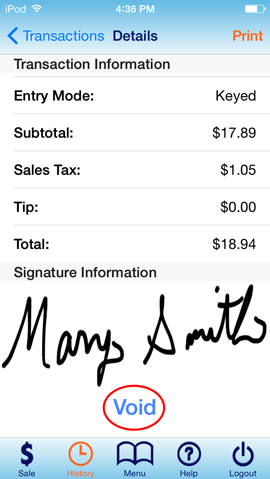 Transactions can also be voided in the Transaction Center. See instructions here.